Featured products for the 2018 Holidays vinyl record fan. Not sure what to get the Vinyl lover in your life this season. How about a gift card for a custom lathe cut vinyl record, turntable, headphones or many other vinyl record accessories. Posted on November 18, 2017 by Chris Bell. We were featured in a story by Sara Machi with KTBS recently. Check it out. Posted on December 19, 2015 by Chris Bell. We are excited to announce our 4 day 25% off sale on all lathe cut vinyl from 8:00 a.m. Friday to 8:00 p.m. Monday! 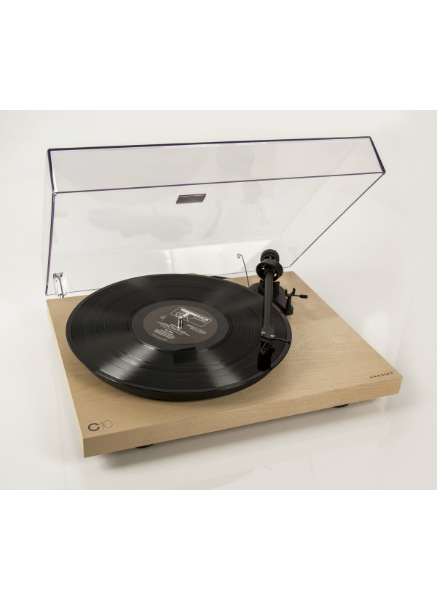 Great time to cut a vinyl record of any of your music for gifts, Kick Starter Rewards or your own collection! All lathe cut vinyl records come with full color paper jacket and clear plastic poly sleeve. At checkout enter coupon code BLACKFRIDAY and get 25% off! Posted on November 26, 2015 by Chris Bell. We are happy to announce we will be carrying Grado Labs amazing line of products! All of Grado Labs products are handmade in Brooklyn, NY. We feel that Grado is the type of craftsmanship that goes along with our companys belief in getting back to basics and making quality handmade products. If you haven't heard a pair of Grado Headphones yet you don't know what you're missing. These are headphones that you keep and pass down to your kids. Long lasting quality and sound for anyone who wants to take their music listening experience to the next level. The SR325 is the top model in Grado's Prestige series. Open-backed and priced at $295, it looks ideal for the earnest headphone listener who doesn't want to take out a second mortgage to buy a pair of cans. Its styling is dated but my reasons for not being a headphone fan are more serious than any lack of cute looks. Most phones simply don't sound convincing enough to substitute for loudspeakers, and the majority refuse to stay perched firmly without crushing my cranium or making me sweat. The SR325 manages to meet both those demands. It also has a sensible lead that's not cumbersome but sufficiently robust to avoid tangling, which is a rare and welcome attribute in headphone leads. It articulated spirited bass guitar lines cleanly and fleshed them out fully when appropriate. It also maintained their presence in the mix, even when the other instruments were giving it plenty. The Grado's top end seemed equally well judged. Picking out detail without making it unnaturally dominant made its portrayal of drum kits and percussion instruments informative and natural. The mid-band integrated perfectly with the upper and lower extremes, conferring a pleasing, coherence and unity on the SR325's presentation. Choosing headphones is very much a personal matter but I'd encourage anyone who wants to escape the typical, in-yer-face, cheap can sound to listen to these Grados. Their warm tonal balance won't be to everyone's taste but the unexaggerated dynamics and vigorous bass might just sway your choice regardless. Posted on August 30, 2015 by Chris Bell.